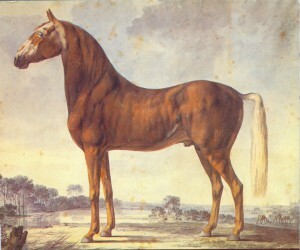 The stallion “Beaver ” was born in 1821. It is a chestnut with unusual white markings. The tail is white (not the manes) and the head has white markings. There also is a vague white stripe on the groins. In fact this horse is a skewbald. The Beaver has a ram-nose as often occurred in this breed. On the left side of the neck the brand of the Frederiksborg stud is visible (a crowned star). Frederiksborg was a royal stud in Denmark which florished especially in the 17th and 18th century. Spanish and Lipizzan horses had much influence on their development, but the standard color was chestnut. King Christian IV was very active in creating a desirable horse for the royal coaches and dressage riding. By the time of The Beaver the stud was already in decline and was closed in 1839. In 1939 efforts were made to recreate the breed and a small number of Frederiksborg horses exist again.